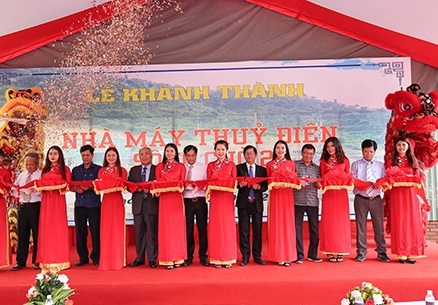 On January 20, 2019, in Ba Cang village, Khanh Hiep commune, Khanh Vinh district, Khanh Hoa province, the Song Cho Hydropower Joint Stock Company (HPJSC) held a ceremony for inaugurating the Song Cho 2 Hydropower Plant. The Song Cho 2 hydropower project with a capacity of 7 MW, 26 million kWh per year and a total investment of 240 billion VND, was started for construction in September of 2016, completed in September of 2018, and has been put into official operation on December 26, 2018. According to Song Cho HPJSC leaders, the project will be a main electricity supplier for enterprises which should be invested in Song Cau (Khanh Vinh district) and Dien Tho (Dien Khanh district) industrial zones. At the inauguration ceremony, the leaders of Khanh Hoa province proposed Song Cho HPJSC to operate the reservoir of the plant safely, to pay attention to protect the ecological environment and at the same time, to coordinate with the relevant departments and agencies of the province to check and supervise the operation process of the plant.